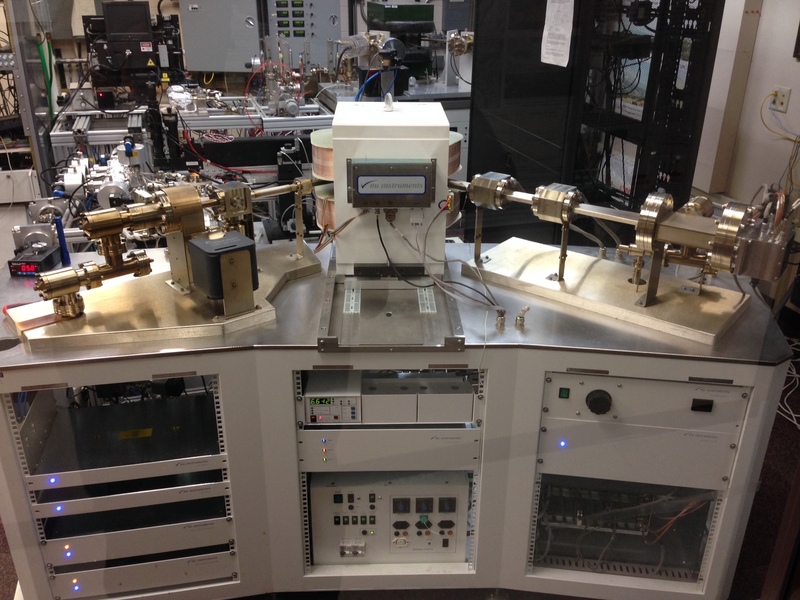 A second automated analytical system, featuring a Nu Instruments Noblesse 5-collector mass spectrometer was commissioned in 2010. 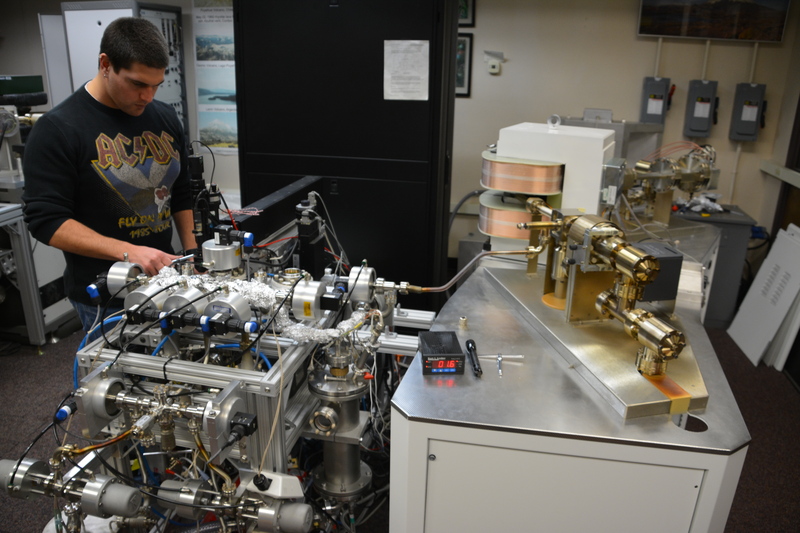 The spectrometer is attached to a gas extraction line with a 60 W CO2 laser, two SAES GP-50 getters, an ARS cryo trap operating at -125 ºC, and two gas reservoir/pipette systems. The Noblesse has an axial Faraday detector and four ETP ion counting electron multipliers‒two at high mass (IC0 and IC1) and two at low mass (IC2 and IC3) positions. Because of the high sensitivity (6 to 8 x 10-15 moles of argon being equivalent to 2 to 3 x 105 counts/s), most analyses conducted are incremental heating of single sanidine crystals or small aliquots (<15 mg) of volcanic groundmass. Analyses of unknowns, blanks, and neutron fluence monitor minerals are carried out identically: during initial measurement of the gas 40Ar (IC0), 39Ar (IC1), 37Ar (IC2), and 36Ar (IC3) are measured simultaneously, followed by a peak jump of one atomic mass unit where 39Ar (IC0), 38Ar (IC1), and 36Ar (IC2) are measured. This two-step cycle, which takes 35 seconds, is repeated 15 times. Beam switching is achieved by varying the field of the magnet with no adjustment to the quadrupole focusing lenses. The peak hop is necessary to obtain 40Ar/39Ar, 36Ar/39Ar, and 37Ar/39Ar ratios required to calculate the age. Accurate and reproducible age determinations require that mass fractionation effects and the relative efficiencies of the different detectors be well known. This is achieved by performing a blank-standard-blank-sample routine (Singer et al., 2014; Jicha et al., in review). Analysis of bracketing standard gas aliquots yields a correction factor, which incorporates both the detector and fractionation effects. Data are reduced using an in-house program modified from the ArArCalc freeware. The mass resolving power of the Noblesse is ~3000 on each IC detector. Importantly, this is sufficient to detect isobars, mainly carbon and hydrocarbon, that interfere with the m/e 36 signal. By positioning the ion beam so that the low mass side of the m/e 36 peak is measured, these interferences are avoided. Because measuring 36Ar is critical to correcting for the atmospheric contribution of 40Ar in young samples—the Noblesse can determine ages more accurately than is possible using the MAP system with its lower mass resolution and broad peak shape. The Noblesse system offers two other advantages that dramatically improve the precision of age determinations: (1) The intrument background count rate is exceptionally low and stable, a 5 minute static measurement yields only 800 counts/s for 40Ar and 5 counts/s for 36Ar, thus sample signals are well-distinguished from system blanks, and (2) Counting statistics for all isotopes are superior because signals are collected nearly continuously on the four IC detectors in 9 minutes, which is only 2/3 the time it takes to scan peaks using the single-collector MAP system. Allen Schaen with Noblesse system. Note the cryotrap between the gas handling system (left) and mass spectrometer (right). Each well in the copper planchet is 5 mm diameter by 3 mm deep and holds up to 15 mg of volcanic groundmass. 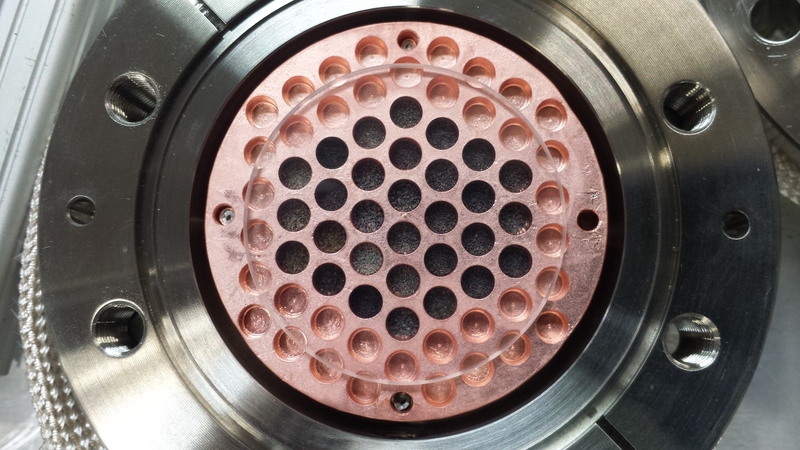 The 60 W CO2 laser beam is defocused to a 5 mm diameter to incrementally heat these samples. A BrF cover slip protects the ZnS viewport windows from deposition of vapor released during degassing of the samples. The Noblesse system. The automated gas handling system on upper left with a 60W CO2 laser in upper center. The gas handling system is connected to the ion source on the left end of the spectrometer. The ion beam passes through the pole pieces of the electromagnet and are turned into the collector block on the right that has 4 ion counting multipliers and an axial Faraday cup. Noblesse gas extraction system. 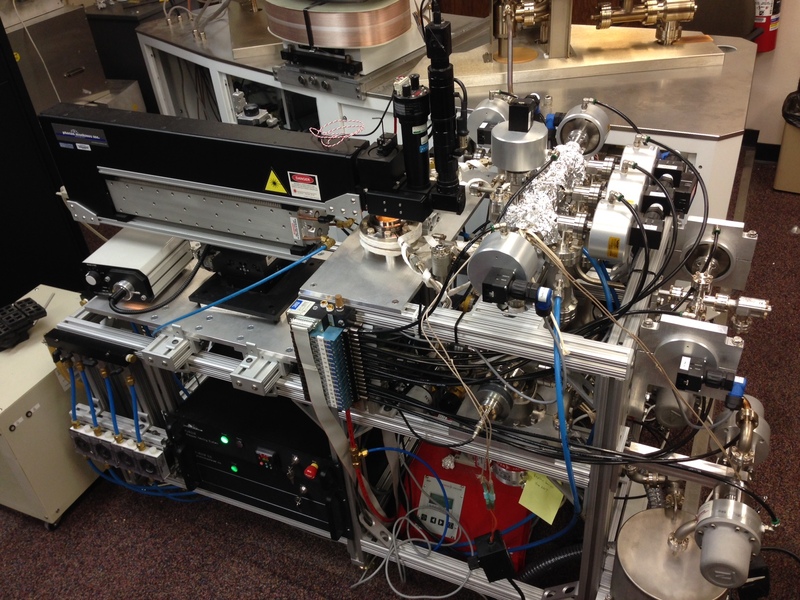 A 60 W Photon Machines laser probe with pyrometer fires through 60 mm diameter ZnS windows to heat samples.